Kudos to Jason DeSena Trennert for starting a campaign to bring the poppy back to Wall Street. On Tuesday, Mr. Trennert and his colleagues at Strategas Research Partners will be wearing red crepe-paper poppies and also sharing them with clients. He's trying to renew a great tradition. Once upon a time, before Memorial Day inspired thoughts of a weekday at the beach, it marked an opportunity to remember those who have made the ultimate sacrifice in defense of America. The poppy became a symbol of remembrance and gratitude for departed soldiers after World War I and the publication of the 1915 poem "In Flanders Fields." When I was a boy there was an American Legion member or two on every block selling the little plastic or paper poppies. It's been a long time since I've seen anyone with one of the little red poppies in his lapel. But you'll have to go here to hear (and see) it. It the competition draw it looks like there will be 19 bands this year. No Grade I competition this year, although L.A. Scots usually put in a performance appearance. A nice couple of reels from Jerry O'Sullivan on uillean pipes, Tim Cummings on border pipes, and Chris Norman on flute. It doesn't say, but the May procession for Our Lady is included. "It is vain to rule if your subjects can and do disobey you. It is vain to vote if your delegates can and do disobey you." Found on this wonderful little page. Another of the English martyrs is commemorated today. Bl John Rochester was a monk of the London Charterhouse who refused to take the Oath of Supremacy recognizing Henry VIII has head of the Church. In consequence he was hanged in chains from the walls of York. There is a short piece on his martyrdom here. Northumbrian small pipes this week. The two tunes are Wards Brae and an old Scott Skinner tune, Lovat Scouts. Someone with a following must have been discussing eschatology the other day since The Inn has received another batch of hits from folks looking for something on The End of the World. I didn't really think about that when I named The Inn but we do get quite a few visitors here from time to time looking for the inside skinny on Armageddon. All of which made me think of Robert Frost's Fire and Ice, which, I suppose isn't really about fire or ice or the end of the world. But I liked it and my streams of consciousness, like the looms of the world, spin as they will. May 9 -- Bl Thomas Pickering. O.S.B. The ninth of May is the anniversary of the execution of English Benedictine martyr, Blessed Thomas Pickering. Lay brother and martyr, a member of an old Westmoreland family, b. c. 1621; executed at Tyburn, 9 May, 1679. He was sent to the Benedictine monastery of St. Gregory at Douai, where he took vows as a lay brother in 1660. In 1665 he was sent to London, where, as steward or procurator to the little community of Benedictines who served the queen's chapel royal, he became known personally to the queen and Charles II; and when in 1675, urged by the parliament, Charles issued a proclamation ordering the Benedictines to leave England within a fixed time, Pickering was allowed to remain, probably on the ground that he was not a priest. In 1678 came the pretended revelations of Titus Oates, and Pickering was accused of conspiring to murder the king. No evidence except Oates's word was produced and Pickering's innocence was so obvious that the queen publicly announced her belief in him, but the jury found him guilty, and with two others he was condemned to be hanged, drawn, and quartered. The king was divided between the wish to save the innocent men and fear of the popular clamour, which loudly demanded the death of Oates's victims, and twice within a month the three prisoners were ordered for execution and then reprieved. At length Charles remitted the execution of the other two, hoping that this would satisfy the people and save Pickering from his fate. The contrary took place, however, and 26 April, 1679, the House of Commons petitioned for Pickering's execution. Charles yielded and the long-deferred sentence was carried out on the ninth of May. A small piece of cloth stained with his blood is preserved among the relics at Downside Abbey. I would have thought St Indract to be about as close to unknown as any saint in the calendar. If it comes to that, he's only in one calendar, a medieval calendar applicable only to the area around Glastonbury Abbey. Wikipedia, of all things, has quite a long piece about St Indract. You can find it here. Admittedly a good bit of it consists of arguing back and forth with itself about the details of the saint's life. “Glastonbury of the Gael”, the monastery which, alone in all England survived through the centuries, under British, Saxon, and Anglo-Norman rule, is believed to be one of the places occupied by the Irish in the fourth century when they were making settlements in western Britain. While the influence was still Irish, at least at a very early date, a Celtic monastery was founded at Glastonbury. Legend links the Saints Patrick, Brigid and Benignus with Glastonbury. Its first church was dedicated to Blessed Mary and St Patrick. A parish was called “Beokery, otherwise Little Ireland.” The lives of many Irish saints were collected or written at Glastonbury, supposedly the source of John of Tynemouth's section devoted to Irish Saints in his Sanctilogium. Tenth century St Dunstan was educated and became a monk at Glastonbury with Irish scholars as his teachers and Irish books for his studies. Indract, an Irish prince and the 21st Abbot of Iona, was martyred near Glastonbury. He had come to Iona about 832 in a time of constant danger from Norse pirates. Blathmac had been murdered on the altar steps. Already the “minda”, sacred articles connected with Colmcille, had been moved back and forth to Ireland several times. Kenneth McAlpin had removed relics of Colmcille to Dunkeld and made it the chief church of Scotland and the Iona brethren transferred the Columban headquarters to Kells in Ireland. Sometime before 854, Indract, his sister Drusa and other religious made a pilgrimage to Rome, setting out, perhaps, from one of the places in Cornwall or Somerset with which tradition connects their names. On the return they were murdered near Glastonbury by pagan Saxons. And in that place fostered, if not founded, by the Irish, were enshrined the relics of Indract and his companions. In pipebandland it's called "The Steamboat". No idea what Pëtr Illych called it. Probably "the country dance bit" or some such. No, I didn't know there was one either. But from May 1943 to 1946 when they were disbanded, Canada had a Women's Army Corps Pipe Band. You can read more about them here. There are a couple of short newsreel videos at the linked site also. Alas, they don't lend themselves to embedding so I can't put them here but you can access the video page and get a sample of their sound. The films also show them wearing a tam, which gives a better look than the picture above. Three Weeks Later. . . .
Well, three and a half weeks later, not to put too fine a point upon it. It has been rather a long time since we put in some time at The Inn. And we have been rather busy. Most of it isn't worth mentioning; just a load of odds and ends that needed doing to keep the household humming along. Oh, I had a couple of interesting gigs in the interim. E.g., I played for the annual St George's Day celebration put on by the Royal Society of St George. (Think about that for a minute: a Mick in Highland dress playing Scottish tunes for the English national day. Only in America.) It was topped off with choral evensong, one of my very favourite services on the planet. Very enjoyable, indeed. I missed mentioning some of my favourite liturgical and saints days. The Forty English and Welsh martyrs were commemorated only last Friday and never a mention here. If you're interested, see Mrs Vidal's Fountain of Elias. . .and don't fail to follow the links. There was also St Maelrubha, the great Irish apostle in Scotland. His feast is on April 21st, but time got away from me on him, too. 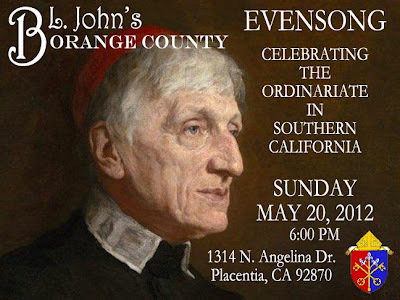 And while we're on the topic of evensong and liturgical days, our priest who presides over our little Anglican-Use/prospective-Ordinariate community in the OC, is, as of last month, our "priest" no more and now officially a Catholic layman, much as thee and me. Although, technically he is a Catholic seminarian on the cusp of ordination to the diaconate. We are, as it were, waiting for our priest to be ordained a deacon. Now, that's a sentence you don't see every day. A prayer for him and his family and our little community would be appreciated. As we have said so many times in this space, we will try to do better in minding The Inn. But, as always, no promises.